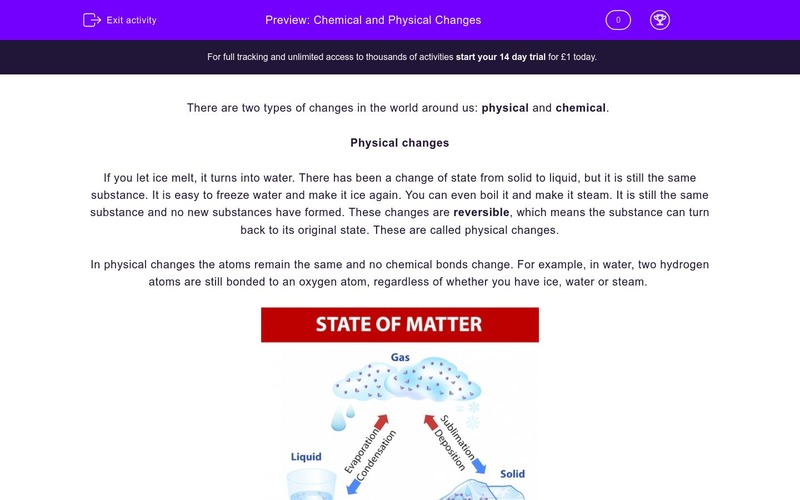 In this worksheet, pupils will be introduced to the differences between physical and chemical changes from a matter in physics perspective. There are two types of changes in the world around us: physical and chemical. If you let ice melt, it turns into water. 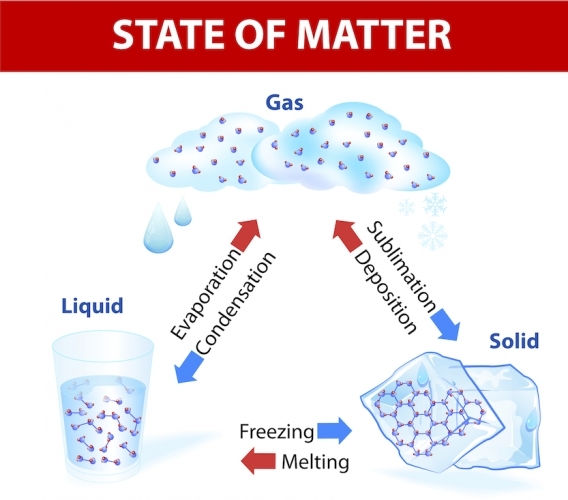 There has been a change of state from solid to liquid, but it is still the same substance. It is easy to freeze water and make it ice again. You can even boil it and make it steam. It is still the same substance and no new substances have formed. These changes are reversible, which means their substance can turn back to its original state. They are called physical changes. In physical changes the atoms remain the same and no chemical bonds change. For example, in water, two hydrogen atoms are still bonded to an oxygen atom, regardless of whether you have ice, water or steam. Chemical changes take place during chemical reactions. In the image above, rearrangement of atoms is clearly shown for the production of ammonia. The atoms remain the same, but their positions are rearranged, which means they bond with different atoms after the chemical change. Chemical changes are permanent changes and cannot be reversed; they are irreversible. When a piece of wood burns, you cannot reverse the reaction to get the wood back. New substances have formed. What is the new substance formed, when ice melts into water? There is no new substance. What type of change takes place when you boil water and it turns into steam? What do we call a reversible change? A change that can be reversed. A chemical change where atoms can reverse back to their old positions. What type of change takes place when you dissolve sugar in tea? What type of change occurs when shredding paper? What is the main difference between chemical and physical changes? Physical changes have new atoms formed. How are new substances formed in chemical changes? Atoms of the substance dissolve in the other substance. Bonds between atoms weaken and they change state. Atoms rearrange to bond with different atoms. Tick the two chemical changes in the list below. What type of change occurs when cooking an egg? What type of change occurs in the food in your body after you eat? There is no new substance formed, when ice melts into water. It is still water, but in a different state. Water boils and turns into steam, but it is still water. This is a physical change. A reversible change is a physical change. The substance remains the same, but is in a different state; it can turn back to the previous state. Dissolving is a physical change. There are no new substances made; sugar is still sugar, but it is dissolved amongst the molecules of water. Shredding paper is a physical change. The paper is just cut into smaller pieces, but it is still paper. Physical changes are reversible, whereas chemical changes are permanent, thus, irreversible. In a chemical change, atoms rearrange to bond with different atoms; that's how new substances form. Rusting and burning are two examples of chemical reactions. New substances are formed and you can't get back the initial substance. Cooking is a chemical reaction of everyday life. After you boil an egg, you cannot make it raw again. The metabolism of food in the body is a chemical change. Food molecules are broken down (digested), so the body takes all the useful substances it needs.